Hello and welcome back to the weekly IDK Blog! Today I am talking about some of the relatively poor financial decisions I’ve made in my life! And no, I’m not talking about my purchase of a $30 Chrome Marshmallow shooter. 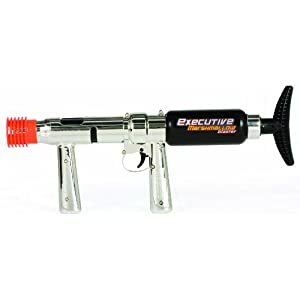 Executive, which means I shoot marshmallows like a boss! Literally. Obviously the amount of money made and time worked varies drastically. While I have not made a whole lot of money from this lifestyle, I have rarely had to sacrifice doing something I enjoy to do something I hate because I need the money. Oh, and at the time of writing this, I have no debt of any kind. Not to a person or institution. I even managed to pay for my own college with these strange jobs! Now, this next idea I’ve heard has also affected me, but in a different way than maybe it was intended. So this quote is usually referenced when it comes to business and hard work. The idea is to put a lot of energy and dedication into something so that it will pay off later. Delayed gratification of some kind, like retirement or investing. It is hard to imagine when I live in a society/culture of instant rewards and immediate results. I’ve known people who have had just one job their entire life. So am I doing it incorrectly? Or am I living a life that most people won’t by jumping from job to job so that I can live the artist’s life most can’t? Either way, this one is a dangerous and uncertain life. But who wants a safe and certain life anyway?